Savvy D-Blog Week 2017: It’s ONLY Money! Today’s blog topic is: The Cost of a Chronic Illness. Woooo, there’s a lot of room for writing here, including insurance, Medicare, coverage, cost of our care, accessibility and much, much more! I’m talking today about the cost of being an Early Adopter! I simply can’t help it. I admit it! When something comes out and looks fairly safe, I WANT IT! I don’t want to wait (hence, #WeAreNotWaiting)! I had one of the very first blood glucose meters in the early 1970’s called the Ames EyeTone Reflectance Meter. It was a clunky, plug-in device, not terribly accurate … and cost about $450. But it was better than testing urine with Clinitest! When I first heard of CGM, I wanted to start with Abbott Navigator … but Dexcom beat them to market … so I jumped in with the very first CGM, the Dexcom STS … it was NOT very accurate but I knew it was going in the right direction. When Navigator came to market, I switched over, until Abbott pulled it off the market … then right back to Dexcom, by then, Dex3. I heard rumblings from the NightScout group … bought all the pieces for the “rig” and jumped in there too, using a Pebble watch. Loved it. Cautiously, I decided to try Looping … and am learning every day and am amazed at the smoothness of my CGM data, especially throughout the night. FIASP! Approved in EU and now in Canada, it won’t be approved by the FDA until the end of 2017. So I want it! Others in the D community are trying it … and even Loopers are figuring out the algorithm using it. Do you know what it is? 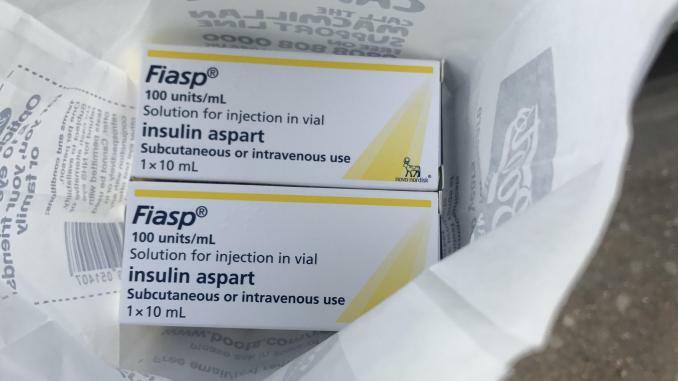 Fiasp (Faster-Acting Insulin Aspart), made my Novo Nordisk, is an ultra-fast rapid-acting insulin. Here’s the analysis I went through to figure out how to get it. It’s available in Canada. I live in southern California. It would be way easier if it were sold in Mexico … but not yet. Order from a Canadian mail-order pharmacy and pay extra. Guess I’ll be ordering tomorrow! Oh cool, I haven’t heard of that! (Been a little MIA in the DOC lately). Thanks for sharing! Thanks Kelley … and welcome back to DOC!